There are movies that pop up in the theatre, and one or two big box office weekends later, they're gone. They're bits of fluff that people dimly remember as good flicks, but they pass on to the ether of time. And then there are the classics, the ones that define generations, define actors; the ones that you remember growing up with, that you can quote lines from, the ones that actually mean something. Gone With the Wind is certainly one of those films. It's half of the magic of Atlanta for me, it's why I make people watch it, if they haven't seen it before. It's one of those movies that's rewatchable, time and time again. I never read the book - correction, I never read anything but the end, so that I could look for the word damn in print. No joke. I do remember being shocked that it was in our junior high library. But, I've always been fascinated by the scope of the movie, the epic saga, and the characters that live on in my head. When I was little, I remember being scared of that Atlanta depot scene, the wide shot panoramic view of all the dead and wounded Confederate soldiers on the ground. Apparently something like 1,600 of those bodies were actually dummies. Still, dang. 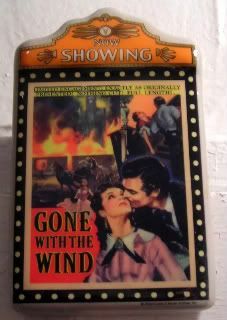 It's totally fitting that I bought this magnet at Margaret Mitchell's place in Atlanta - a fascinating tour and museum, filled with movie memorabilia and just really cool stuff around the book and the movie. It was truly one of my favorite places of town. Even if none of the friends I was with had seen the movie. Oiy. Picked this one for today, because we're at about 15 days till go time for our golf event, and I'm mentally going through my day tomorrow, and thinking that at some point, oh, about 15 days from now, I'll have run out of tomorrow and tomorrow and tomorrow. Heh.